Salt, What Type Should You Store? Until I was asked a question about the different types of salt that are available, I had no idea there were so many types. Since then I have done some research on the varies types and how they are best used. Iodized table salt is the most common. This is the typical Morton Salt that most of us have in our saltshakers at home. The reason it’s called “iodized” is that today, most salt manufacturers fortify the salt with iodine. Iodine deficiency causes thyroid gland problems, including “endemic goiter”. In many countries, iodine deficiency is a major public health problem. Unless you have an alternative source of iodine such as kelp, I recommend that you stock iodized salt. Rock Salt is normally used for making ice cream and deicing sidewalks. Because of the methods that are used to mine rock salt from the ground, rock salt is not sold for use directly on food. It is usually sold in large chunky crystals that would need to be ground before it would look like table salt. Pickling or Canning Salt is normally used for canning, brining pickles and fermenting foods. Like table salt, pickling salt may come from the earth or the sea. However, unlike table salt, pickling salt does not contain anti-caking ingredients or iodine, which can turn pickles cloudy, or dark. In addition, fine granules make pickling salt easy to dissolve in a brine. Pickling salt is 100 percent sodium chloride and the purest of salts. What Type of Salt Should You Store for Brining? 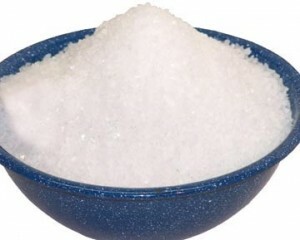 Sea Salt is salt produced from the evaporation of seawater. Many people claim that because of the increased mineral content that using sea salt is healthier. In addition, some people say that sea salt tastes better. Personally, I can’t tell the difference in taste, but I can tell the difference in price. Sea Salt can cost $2 to $15 a pound. There are many other specialty salts on the market, but for our purposes, I recommend that you stay with table salt and pickling or canning salt. These are by far the most cost effective. Now I know that some of you are strong believers in sea salt and are willing to spend the extra cash to purchase it. I still suggest that you get some cheaper salts for preserving food and trade. Salt is inexpensive and I think that you should store up to a 100 lbs per person. What About Your Food Storage after a Flood? This entry was posted in food storage, preserving foods and tagged salt. Bookmark the permalink. One Response to Salt, What Type Should You Store? I had a friend who swore that sea salt was not subject to the same processing that salt from the earth was subjected to. I read an article somewhere, not sponsored by Morton’s, that research showed salt from the earth had to undergo processing, also. For 30 years I did not use iodized salt or give it to my family. Salt can cause outbreaks, and I valued my almost perfect complexion. I figured that I consumed enough salt in food, processed food, fast food, and restaurant food. I may have been wrong. About 11 years ago, one doctor mentioned my thyroid was enlarged. Then I went to a surgeon who wanted to watch it for a while. She would not run tests, she said, because it was so tiny.However, when I was adamant that I only had 30 days of insurance, the doctor immediately scheduled me for tests and surgery. She took out half my thyroid and a sphere more than one inch across. It is the type growth that eventually becomes cancerous. The federal government insurance paid all but $25 or so of my doctor appointments, surgery, and follow-up treatment, plus meds for a year. For years before I had trouble swallowing water, much less food. Even a banana chewed thoroughly was so difficult to swallow. Now, I must take levothyroxine for the rest of my life, suppressing the other half of my thyroid function. The thyroid still works, so if something happened, and I could not get my med, I would probably be okay since I am older. Doctors always gave me an antibiotic for the swelling they felt in my neck. That really annoys me! I may or may not have caused this problem by avoiding iodized salt.